Novelist Paula McLain has been on a quest to write about intrepid women. For Circling the Sun, her subject was Beryl Markham; in The Paris Wife, it was Hadley Richardson, Ernest Hemingway’s first wife (1921-27), who introduced the then little-known writer to important literary figures. 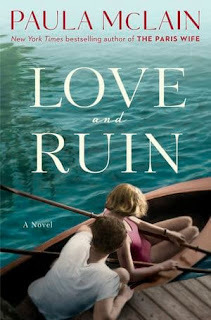 Love and Ruin could be considered a sequel to Love and Ruin, except Hemingway had a second marriage to Pauline Pfeiffer (1927-40) before he hooked up with Martha Gellhorn, his third wife (1940-45) and the main subject of McLain’s latest novel. Gellhorn is the heroine of Love and Ruin, but an imperfect one. It took her a few years to realize that she could not have it all: marriage, career, domesticity, and respect. We see her struggle to be taken seriously on her own terms, not as Ernest Hemingway’s wife. McLain's Gellhorn seesaws between conformity in one moment and a lioness on the hunt for what she wants the next. This made her as complicated and contradictory as Hemingway. It also made it impossible to sustain her marriage. For his part, it’s hard to determine which flowed more freely in Hemingway, testosterone or booze. Like Gellhorn, McLain shows him as a volatile mix of fragility and fierce independence. Mostly, though, Hemingway’s ego only allowed women to shine in his reflected glow. McLain’s sprawling novel takes us from Key West and Cuba to Madrid, Finland, and Germany. In some ways, it’s about two people seeking unconditional love who spend much of their time setting conditions. The relationship only worked when Papa and Marty were in the midst of danger and on the move. The title says it all: love and ruin. No one will ever write a book about either figure titled Stasis and Happiness. I am a big fan of McLain’s novels and love the idea that she puts strong women at the center of her tales. Yet despite the fact that Love and Ruin features two powerful and fascinating characters, it’s not up to McLain’s usual standards. It’s a good book and worth a read, but it feels flat in ways that are hard to describe. Perhaps the very thought of a sustainable relationship between these two individuals is so absurd that that we feel what must happen long before McLain describes it. How does one explain abortive domesticity without taming two individuals whose very natures rebel against that ideal? Would we believe it were we treated to moments of mundane wedded bliss? McLain gives us a woman who ultimately refused to be either a goddess or a victim, but once we know this, the rest of the story is telegraphed. I seldom feel this way about historical figures, but for once I favor a film over a novel. The 2012 movie Hemingway & Gellhorn–with Clive Owen and Nicole Kidman in the title roles­–tells the same story as McLain’s book, but we have visuals to flesh out the details and provide a dramatic backdrop. I wouldn’t call Love and Ruin a misstep–McLain is too good a writer–but I did find it less than the sum of its parts.